A good kitchen knife is usually something you use for many years. Some of the kitchen knives I’m using today are over a decade old. That’s why it’s important to invest in a top quality kitchen knife set so that you’ll be able to use it for a long time without any issues. Just like ceramic pots and pans, ceramic knives are on the rise because of the advantages that the material offers. They have ceramic blades that are typically very sharp, lightweight, robust and require very little maintenance. While using ceramic knives has some great benefits compared to using their metal or stainless-steel counterparts, they do have their limitations. Here is my list of best ceramic knife sets, based on own experience, external reviews, number of pieces included, manufacturer and materials used. I’ve been using a Kyocera ceramic knife for a couple of years now and couldn’t be happier with it. It’s light in the hand, razor sharp and literally cuts through anything. Bread, meat, fruits, vegetables, I can use my ceramic knife for pretty much anything. But before investing in a ceramic knife set, it’s good to get a better understanding of what ceramic knives are about and how they differ from conventional steel or metal knives. A ceramic knife typically has a thinner and lighter blade. As such, they aren’t the best knives to use when cutting through hard items such as frozen food or bones. Not that they aren’t sharp enough, it’s just that they are a bit too thin and light for that kind of cutting work. The blades could potentially snap. But don’t be fooled. Ceramic material is actually much harder than metal, which makes ceramic knives very durable. In regards to maintenance, simply use a hardwood or plastic cutting board when using a ceramic knife. Hand wash and properly dry the knife after use and store it protected from other kitchen utensils. Ceramic knives are durable and very low maintenance. Also, to sharpen a ceramic knife, you would need a special ceramic knife or electric sharpener. A conventional knife sharpener is not suitable. The good news? A top quality ceramic knife hardly needs any sharpening when used and maintained appropriately. In fact, you may never have to sharpen your ceramic knife. Another advantage of using ceramic knives that’s worth pointing out is that the blades don’t rust. Metal rusts but ceramic typically doesn’t because it’s non-reactive which is great. Ceramic also doesn’t absorb odors and doesn’t stain. In short, a good ceramic knife is light-weight, sharp, durable, multi-functional, low maintenance, but it’s not the best knife to use for cutting frozen meats. What to Look for in a Ceramic Knife Set? 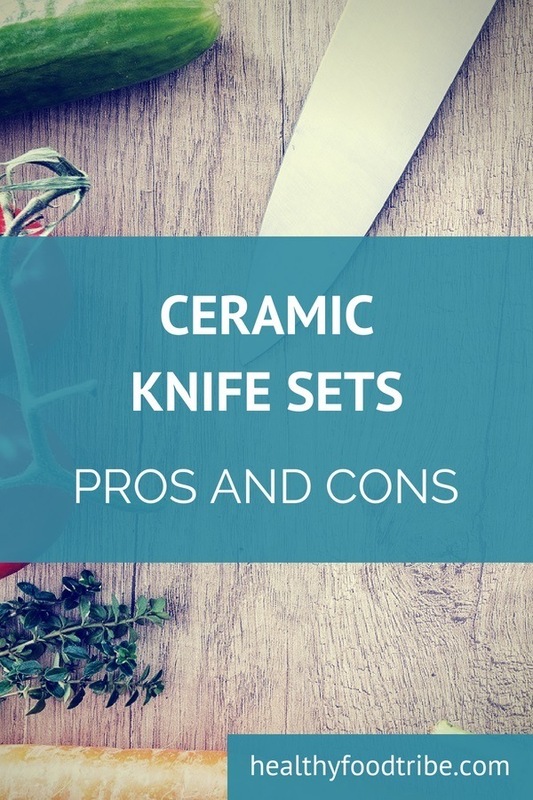 Most ceramic knife sets will look fairly similar, but there are a few things to consider. This one may be obvious, but make sure the blades are 100% pure ceramic and not just ceramic coated. There is not much benefit in having blades with only a ceramic coating. You will often find that the handles of ceramic knives are in the same color of the blades. So you can get a ceramic knife set consisting of all colors of the rainbow. Some love it, but it wouldn’t be my personal choice. I prefer a neutral-colored, black handle. Some handles are made with plastic or rubber, others with hand-crafted wood. Plastic is obviously cheaper but often also more ergonomic. The most important thing here is that the handle provides a solid grip. The material used is less important. Some ceramic knife sets contain up to 8 knives, some only come with 2 ceramic knives. It may seem better to have more knives in one set, the quality may have been sacrificed. What matters is how many knives you actually need, not how many are included in a set. The other thing to point out is that some manufacturers also include blade guards and peelers as included items which can inflate the total count. So make sure that you know what you’re buying. Some sets include one chef’s knife, other’s don’t. The chef’s knife is typically the largest and most important item in a ceramic knife set and can handle almost all cutting work. You should ideally go for a set that does include a stand-out chef’s knife and avoid sets that only include knives of the same size. Let’s have a closer look at 5 of the best ceramic knife sets currently available. Founded in 2016, Tokyo-based Kikusumi is a manufacturer of steel and ceramic knives designed such that they are functional, durable as well as affordable. This particular ceramic knife set contains the 3 most essential kitchen knives. The 7 inch Gyuto chef’s knife is suitable for cutting large quantities of food with ease. Gyuto is a Japanese version of a classic chef’s knife with thinner blades and sharper edges. The 5 inch Santoku knife is great for precision slicing, dicing and mincing. The 3 inch paring knife can be used for chores like trimming, coring and peeling vegetables and fruits. Take note of the ergonomic knife handles, designed for both left or right hand cutting. The shape is based on traditional Japanese knife design that match the curves of the hand perfectly. They also have a soft tactile grip that prevents slipping. Kyocera is a Japanese ceramics and electronics manufacturer headquartered in Kyoto. They are mostly known for their printers, but they also sell ceramic knives and cookware under the retail name Kyocera Advanced Ceramics. Made in Japan, the popular Revolution Series of ceramic knives features deeper blades for improved knuckle clearance, ergonomic resin handles in different colors and ultra-sharp ceramic blades that are rust-proof, stain-proof and germ resistant. The ceramic blades are made from Kyocera’s very own proprietary zirconia material. 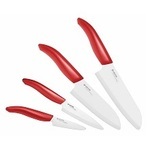 This bright-red ceramic knife set contains 4 knives ranging from a small 3-inch paring knife to a 6-inch Santoku chef’s knife. As mentioned above, I have been a very happy user of a Kyocera ceramic knife for a while now and strongly recommend it. This Kyocera Revolution ceramic knife set is essentially the same as the previous one. The only difference is that the blades have been given a sleek black finish. This black version also contains a 6-inch chef’s knife, a 5.5-inch santoku knife, a 4.5-inch utility knife and a smaller paring knife. The first thing you’ll notice in in this set is the brightly colored handles of the knives. The handles are not just bright though, they are also very ergonomic and are made with hard plastic to ensure a good and firm grip. This Cuisinart ceramic knife set includes 5 knives ranging in size from a 3 inch paring knife to a 7 inch serrated bread knife. Unlike many other sets, this particular set also comes with a convenient knife block. Great for experienced as well as beginner chefs, this 5-piece pure ceramic knife set is a collection of the most common kitchen knives. With ergonomic handles and sharp blades, this ceramic knife set can handle all types of cutting and chopping with ease. VOOV gives you 4 knives with matching knife sheaths and also a stylish knife block. The knives are a large 7-inch chef’s knife, a 6-inch serrated knife, a 5-inch santoku knife and a 4-inch paring knife. At a very competitive price, this ceramic knife set is one of the most affordable ones in this list of ceramic knife sets. Hopefully this article has given you a better understanding of what ceramic knives are about. I’ve been happy with my ceramic knife for quite some time, just as I have had good experiences with my stainless steel knives. A good quality ceramic knife set will last many years, as long as the knives are well looked after and used the right way. There are definitely benefits to using ceramic knives but they also have some limitations.